Chennai, April 10: They are both in the home stretch of their careers, but Chennai Super Kings spin duo Harbhajan Singh and Imran Tahir once again have shown that age is just a number. Taking on in-form Kolkata Knight Riders, CSK won by seven wickets as Harbhajan (2/15) and Tahir (2/21) bowled magnificently to derail the KKR batting. Speaking after the game, skipper Mahendra Singh Dhoni compared the duo to wine and said that the two have matured beautifully. CSK beat KKR by 7 wickets | Kolkata Knight Riders vs Chennai Super Kings Live Cricket Score 23th T20 Match. "The age is on their side (Bhajji and Tahir). They are like wine and they are maturing. Bhajji has done well in whatever games he has played. I have fallen back on Imran whenever needed and he has come up with very good performances. "Overall, the bowling unit looks good. But once we play on better and flatter wickets with smaller boundaries, we will have to see what is the best combination to play with," he smiled. Asked about the kind of support he gets in the city every time he plays here, Dhoni said: "I have been here for a very long time. Lot of good things have happened for me here including my Test debut. The crowd loves CSK and I have been a part of the franchise from the start. It is a special connection and they have really adopted me." 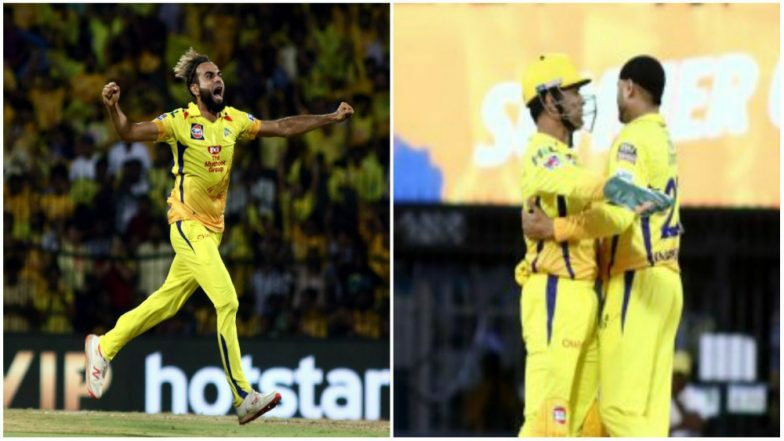 While CSK won the game, Dhoni once again pointed that the wickets need to get better as batting becomes difficult on wickets like the one at Chepauk. "We have been cribbing about the track but we have ended up winning the game. Losing Bravo, it is slightly difficult for us to get the combination as we are missing the all-rounder. David (Wiley) is not here, as well. So, it can't be a straight swap. "I don't think we want to be playing on these tracks. It becomes too low scoring. It becomes slightly difficult for our batsmen as well. It is slightly more difficult batting first but once the dew comes in, it gets better," he pointed. Commenting on the way the bowling unit functions, he said that he prefers to only guide the bowler by telling him what the batsman is trying to do. "If you once set your own plans, then I step in looking at how the batsman is playing. I don't think we have very long bowling meetings which lasts at best 15 minutes. Nowadays, I have been emphasising on one-on-one meetings and even I am not part of that," he said.